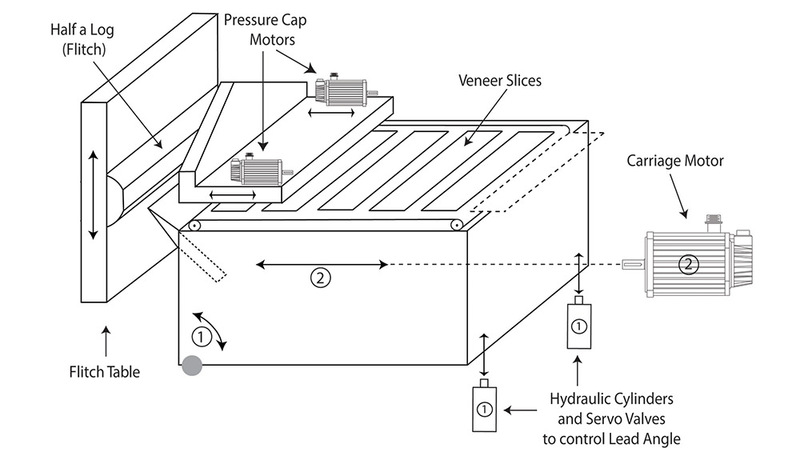 Servo controls are enabling a veneer-slicing machine to cut sheets as thin as 0.005 in. with a 0.001-in. tolerance. The five-axis servo control system that makes this possible comes from Industrial Indexing Systems (IIS). The slicer, developed by Capital Machine Co., Indianapolis, Ind., consists of a table to which a half log (called a flitch) fastens, and a carriage with an attached blade. The blade incrementally feeds the blade toward the wood before it makes a down stroke on the flitch. 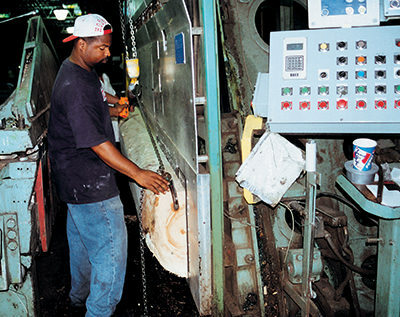 A thin sheet of veneer gets sliced off and carried away on a conveyor mounted above the carriage. The blade retracts at the bottom of the stroke and increments to get ready for the next cycle. At a typical speed of 90 strokes/min, the machine can cut between 20,000 and 30,000 pieces of veneer in a single 8-hr shift. One factor that makes it difficult to cut a thin sheet with any consistency is the varying size, shape, and density of the logs. They can be up to 18 ft long and weigh as much as 10,000 lb. The machine’s most critical motion is that of the carriage which feeds the blade into the wood. A 15-hp motor moves that large weight of the carriage. A pressure-bar adjustment compresses the wood as it passes the blade. This makes for a smooth sheet of veneer by eliminating much of the wood’s natural inconsistencies. Two 1.3-hp servomotors adjust the gap between the blade and the pressure bar. A pair of hydraulic servovalves, one at each end of the blade, control the lead angle of blade attack on the flitch. The servovalves can change the blade angle to compensate for blade wear and dulling. Dulling changes the effective angle of attach on the wood, potentially creating rough cuts. The slicer adjusts blade angle in just a few seconds via servo-controlled adjustments. The same task once took 25 min when done manually and was usually done at least a dozen times every 8-hr shift. Blades are normally changes once per shift, more frequently if they hit embedded objects like fence wire, nails, or bullets. This is typically a 5 to 40-min process. But the ability to quickly and accurately adjust carriage and blade location and lead angle contributes to a speedier blade change. Servocontrol also lets operators adjust sheet thickness with the push of a button. Without servo control, adjustments in manually controlled machines were made via ratchet feed gears and took about 20 min.